Sri Lanka Telecom Group PLC Chief Executive Officer Dileepa Wijesundera during a recent interview reflected his undogmatic approach to his triple value propositions for the SLT in the next five years; namely the People Proposition, the Value Proposition and the Profit Proposition. His receptiveness to new ideas and his ability to get the job done apparently come from his professional maturity spanning over 35 years in cross-cultural experiences in the international corporate arena. Engineering, managing, negotiating, marketing, innovative thinking, relationship-focus and deal-focus have become second nature to him, thanks to his globetrotting both in grey suits and boiler suits. Although he thoroughly enjoys working and doing business with anyone, he prefers to spend his private time with his family and friends who seek his company not because he is the Group CEO of SLT but because he is Dileepa Wijesundera. Take a quick peek at this unique CEO who has set about his task of building Sri Lanka’s ‘Connected Future’. This outspoken corporate leader can unleash human genius and inspire deep commitment and magnificent levels of service from his top executives and skilled workforce to provide a superior service to SLT customers. Born and bred in Galle and educated at Royal College, Colombo, he qualified as an engineer with a BSc in Civil Engineering and obtained an MSc in Management from the Loughborough University (UK). Along Dileepa’s upward career trajectory, he has been a top level executive with extensive experience in project logistics, profitability and restructuring both at public and corporate level. He has held top positions in a number of prestigious corporate bodies including Head of Emirates Sky Cargo, Canada, Senior Vice-President Qatar Airways, Chairman, Sri Lanka Ports Authority among others. 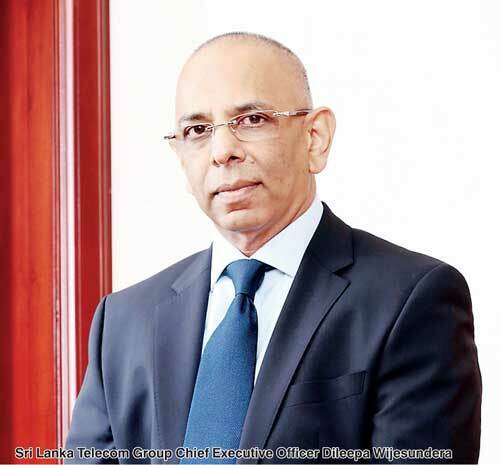 On 9 March this year, Dileepa assumed duties as Group CEO of Sri Lanka Telecom PLC, in pursuit of excellence for SLT – the flagship telecommunication organisation of the country. Q: Many top executives would be wishing they had your enviable job of sitting here as SLT Group CEO. But what is your strategic approach to deal with the challenges in the journey forward? A: As an organisation we have first got our fundamentals right. In my experience, the most important asset of an organisation is its people. The technological capabilities as well as expertise in the industry and within the organisation are vital in creating a strategic approach to meet the challenges. Historically looking at it, SLT has been there for 150 years. So, nobody can discount the expertise it carries. My primary goal is to develop that strength further and bring all that talent together and make SLT a very strong company both in terms of commercialisation and technological advancements. During my first six months here, I’ve managed to bring teams together at top level and strengthen the cooperation within the Group. Q: Are you happy with the level of cooperation you get from your top management? A:Yes, of course. In fact, I made a statement recently that in my career of 35 years—95% of which was overseas in top corporations—in the oil and gas industry, airline industry, power generation industry etc., the best team I have put together is the SLT team I have here. Q: Tell us where you have worked for these industries including your short contractual stints. A: England, Canada, Sweden, Egypt, Qatar, Algeria, Nigeria, Venezuela, Malaysia, Indonesia, Taiwan, China, India and Sri Lanka. Q: You have brought a wealth of experience to the SLT. How will you be putting it into good use of SLT? A: What I bring to the table is a diverse set of corporate expertise and corporate management practices. And that is for building highly competent and strong teams. Recognising talent within an organisation and harnessing it to the full potential has contributed to my success elsewhere. So, one of my main focuses would be on recognising the talent within the SLT Group, empower it and bring it to the surface. Further, project planning needs to be streamlined and the use of superior quality material in our products and services will be ensured, leaving no room for use of any substandard equipment or accessories or peripherals. Q: Have you found out what’s going on in the market to plan your next moves? A: Yes, we are keeping our ears to the ground. If you look at our business, you will see that our business direction has already been set in a purposeful manner. That’s the reason why SLT has been in business very successfully, throughout its long and illustrious history. The business aspects and technological advancements have been built by experts and co-experts within the company. I have chief officers who are very knowledgeable about the market. They know their subject. My job is to encourage them to bring their findings to me and I incorporate my own expertise into their perspective and fit it all into the big picture, and then drive forward. I allow the core SLT personnel the total freedom to do things in the right way and deliver the targets set by me. They know that I’m very liberal in my approach to their working methodologies but that I’m very strict on optimum performance and tangible results within given timelines. Q: Have you identified the changing outlook of the telecommunication business? A: Yes, we are fully aware of it. For example, one of the things we recently did was to change our direction in marketing. We have a wide range of communication solutions, tech offerings and have made substantial technological advancements, but we have been catering to a traditional segment of the market. We have not recognised the full potential of the existing market. So, I suppose my contribution is to guide the collective expertise into a new era by recognising the need out there in its broadest sense, and provide solutions to them to increase the value proposition to the consumer and profit propositions to the company. Q: Have you taken the temperature of consumer needs? A:Yes. This is something I’ve gained insights into through my global exposure to the market; to determine what is already available in the market, the emerging trends of the market and to match and upgrade our offerings to the transforming demands of the market. What’s most important here is the creation of a new market space with innovative SLT offerings and convincing the consumers that SLT offers them ‘just the thing like no other’. Q: Data services are becoming a major source of income for the players in the industry. How do you see it? A: If you look at the global picture, the advancement of data is exponential. It would be naïve of us to sit here and assume that purely on voice market you could propel the business. There’s an increasing demand for storing and transferring of data for business purposes. The need for transferring large volumes of data keeps increasing. We are looking at data in a very serious manner. The future is data. Q: Tell us something about SLT product innovation. A: You need to look at applications. For example, an SLT application for gourmet recipes; if that’s available; consumers will love to use it because it will make their life more exciting and easier. So we need to think out of the box to enable Sri Lankans to get the best communication solutions and make them feel that they belong to the new world. If we are “there”, there can be no doubt that SLT is a brand you can’t do without. That’s exactly the strategic direction we are looking at. Q: Update us on SLT’s submarine cable network, Mobitel 4G LTE network and ultrafast broadband service through FTTH technology. A: The new sub cable will be launched in 2017, opening new international business for SLT. Meanwhile, FTTH or Fibre to the Home is progressing well with increased sales in the past few months as a result of the ‘speed up’ campaign. As for LTE, we are seeing similar demand particularly in Green business practices. Q: Would you like to share with us some latest sales/growth figures? A: As a Listed Company we cannot publish statistics of this nature until they are released to the Colombo Stock Exchange (CSE). However, it can be said comfortably that our sales figures have been on an upward trend in the past three to four months. Q: Some employees say there are salary anomalies in the organisation. A: There may be anomalies in a large organisation which has been in operation for 150 years. However, you will find that SLT is one of the best paymasters in the industry. Our staff cost component as a % is one of the highest in the industry. Any anomalies in an organisation of this size cannot be resolved overnight as it would involve a lengthy process. Q: Some SLT employees at the middle level have a grievance that the hierarchical structure of the organisation is too slow in making decisions. Is this true? A: If you make decisions to meet the needs of personal needs of people, of various pockets of people, then you can’t run an organisation. Some will claim that the decision making is slow because the decisions are not being made to suit them. I will not make decisions to suit a group of people or win them over. That’s not the purpose. I have to make decisions to suit the big picture of the organisation, its growth and its sustainability. So there will always be people who would be saying this. Q: Some SLT employees say engineers dominate every department of SLT; Finance, Accounting, HR, Administration etc. so that the company has a bias against other professionals. A: I strongly believe that an organisation like this must have a wide range of expertise. The reason that the company has been dominated by engineers is traditional. That’s the way the organisation has been set. All the processes and procedures have been set in that fashion. But we need to start recognising other expertise in the fields of information technology, human resources, administration etc. And we are beginning to look at it. I’m a person who has been successful in running organisations as I am not much into treating qualifications as the superior thing. Instead I look at the job-need and who fits it best. For example; there’s a certain job to be done and you have to be open minded who can do it best. It could be an administrator, it could be an accountant or it could be an engineers. Qualifications don’t necessarily get the job done. In the end, what it takes is your skills and commitment. So it’s about people. Q: The fiscal end of the year is round the corner. What will the SLT balance sheet look like? A: SLT has a very strong balance sheet. We will meet our targets. Our sales have improved in the last two months to catch up any deficits. SLT is looking very healthy in its financial statistics and we will continue to consolidate our position in the coming four months of the year as well. Q: SLT is not having a field day in the market. You are up against competitors. A: We can deal with any competitor. Competition is healthy. Competition makes us tick and think. In the absence of competition you don’t have a very healthy business environment. Our competitors have certain strengths and we have other strengths. Market is out there for all. So I don’t think that we have to fear competition. Competition energises us more and it keeps our business abreast of all the latest developments. Go back to the times when you were 18 or 20. And imagine there was this beautiful girl and you were not the only one vying to win her attraction. Now you can’t take it easy because you have competition, so what you do is prime your game in winning her attraction. This is a simple example from real life which shows that competition is healthy because it empowers you to try harder and do better. Q: Have you made any major mistakes in your career? A: Loads. I remember once, I was doing a ‘test pack’ in a gas plant. I was a young engineer. I had put the wrong labels on….I must have been to a party the previous night, I’m not sure. In a gas plant if you put the wrong labels and open the valves it’d be absolute disaster. But for some reason, just before opening the valves, I spotted it and the disaster was averted in the last minute. I learned from it. That was one of the biggest technical mistakes I had made. And in several other instances, I made wrong decisions in terms of people and corrected them along the way. I admit my mistakes, and I own up to them, and I learn from them. If you do that, a lot of people are willing to help you. If you keep denying your mistakes, no-one would be willing to help you. You will cause more harm to yourself that way. Q: Young business executives would like to have your advice on building their careers. A:I’m never one to espouse grand opinions or advice. Building a successful life or career is about watching the inspirational behaviours around you and emulating them without being a copycat. Add values of the people you admire to your character while preserving your own core values and your unique identity. That’s what I have been doing and it has proved worthwhile. A: I believe in keeping myself in good shape so when the time permits I play tennis or go swimming. I love landscape photography and organic farming. I spend some of my leisure time on my farm at Padukka where we get all our fresh produce from, which I share with villagers, friends and family folks. I want to use the farm as an example to encourage children to grow organic food, not only to reap its harvest but also to derive pleasure from working with the nature. You know, we haven’t bought rice for the last eight months. The supply came from my own farm. Q: Tell us about your wife. A: She is a very supportive, wonderful wife and a caring mother. We do quite a lot of charity on our own at community level without becoming members of charity organisations. My wife provides support to a foster programme in which 20-30 underprivileged children are being looked after. Q: Do you believe in super natural powers? A: I do not believe in or seek solace from super natural powers but this is a personal view. Q: A new conciliatory political culture has emerged in the country. Will it be a stimulus to fulfil your responsibility as a professional? A: Let me answer that this way. I strictly consider myself a professional. I have been trained to be so. In this new political culture, what can I do? That’s how I look at it. What I can do is; take this organisation from strength to strength and set an example as a professional by fulfilling the task entrusted to me. If you ask me about the current political environment, I would say that I’m confident that it will succeed for the benefit of the country. I hear and see that politicians are going to great extent to see that it works. We as professionals have to make our equal or better contribution to make that work. But I must say that we professionals must do our part without crossing our professional boundaries.